Makes a superb evergreen hedge of easy and fast growing habit, ideal for windy or exposed positions. Lovely two-toned foliage effect in spring when striking new silvery leaves contrast with the deep green of the old; perfumed white flowers in late summer. Bright golden yellow small leaves. An attractive contrast to many other hedge plants. An easy to grow low hedge. Ilex aquifolium produces many, white, fragrant, winter to early spring flowers, followed by ornamental blue-black fruit, which attract birds. Mature plants reach up to 3m. Makes a good evergreen hedge. 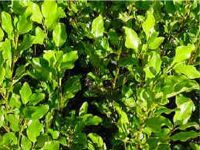 Griselinia Littoralis is an excellent evergreen subject, which can be used to good effect as an individual specimen or makes an excellent evergreen hedge. The attractive foliage is bright apple green that always looks smart and effective even when there is snow and ice on the ground. 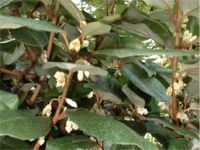 Griselinia littoralis is excellent choice for maritime exposure. Griselinia littoralis Variegata makes a lovely evergreen hedge with attractive pale apple green leaves with a pronounced creamy white variegation. Though not quite as hardy as the all green foliaged Griselinia its very suitable for milder coastal conditions being tolerant of wind.